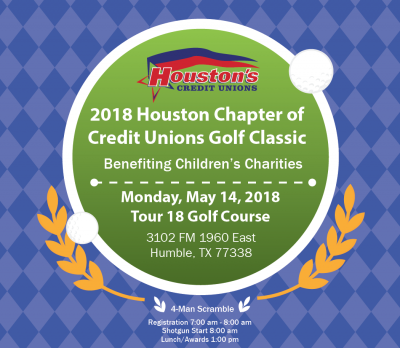 In the spirit of credit unions helping children, the Houston Chapter of Credit Unions is hosting a Golf Tournament to raise money for local charities. For every dollar raised, 100% goes to children’s charities within the Houston area and the Disaster Relief Fund. There are many ways you can be a part of the tournament; become a corporate sponsor (Platinum, Gold, Silver), sign up a team to play a round of golf just for fun, sponsor a drink cart, or sponsor a hole. Together, we can reach our goal of $60,000. Be the one that makes a difference. Contact Brian Gilbert at Members Trust FCU for more info. Click here to fill out the registration form! Space is LIMITED! Sign up early!